Charlotte Mitchell lives in Elk Grove with her husband Ken who is a fifth generation farmer, and their two sons. She was born and raised on a commercial sheep and cattle operation on the Sonoma County coast. 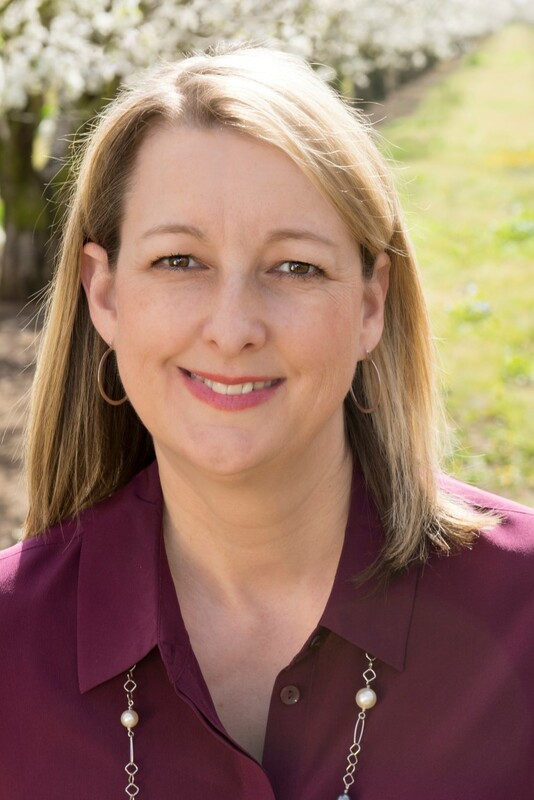 Charlotte has a strong reputation in the agriculture industry, having worked many years at the Sacramento County Farm Bureau, California Farm Bureau Federation, California State Fair, and other related organizations. Part of her motivation for doing what she does with commitment and passion is to ensure her boys have the opportunity to be 6th generation farmers. She loves working with great people who share the same values of agricultural conservation. Melanee Cottrill lives with her husband in Elk Grove and comes from a family history of potato farming. Her mother worked for several years for a large farm in Yolo County. Melanee holds Bachelor’s Degree in History and is in the process of earning her Masters of Business Administration. She previously advised many types of nonprofits. In her free time Melanee likes to walk her dog, read a wide array of books, watch shows with her husband, learn new things, and participate in her Toastmasters Club. Melanee loves doing work that she believes in and working with people who genuinely want to take care of the world. Aundriea Montzingo lives with her husband in Courtland and comes from an agriculture background. Her husband is a farmer in Clarksburg with his farm’s biggest crops being processing tomatoes and pickling cucumbers. Aundriea holds a Bachelor’s Degree in Animal Science with emphasis in Agricultural Business Management and Leadership from Oregon State University (OSU). 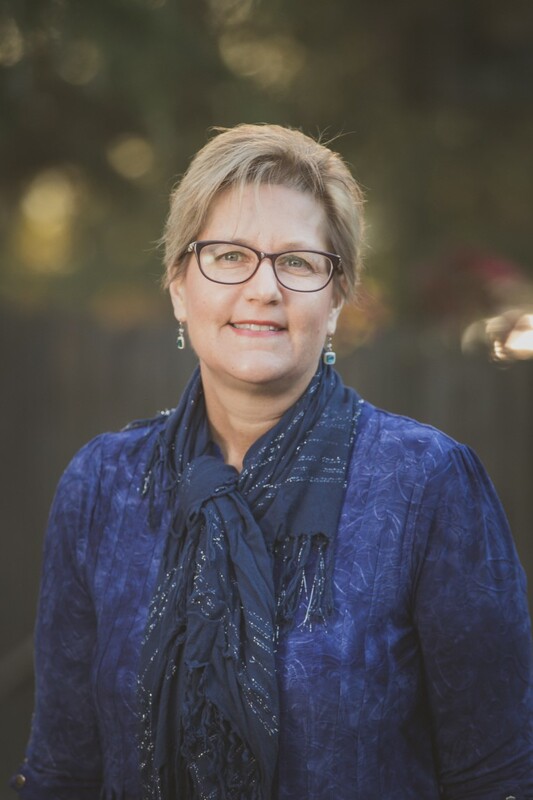 She holds a strong agricultural background having worked/volunteered many years at the OSU Beef & Swine Center, Yolo County Farm Bureau, Sacramento County Fair, Yolo County Fair, Collegiate FFA, and Sigma Alpha, Professional Agricultural Sorority at OSU. Aundriea loves to work with people who have the same respect and passion for agriculture that she has witnessed in recent years. Chelsea Molina lives in Elk Grove with her large black Labrador Retriever, Hudson, who can be found with her retrieving waterfowl in fields from October to February. 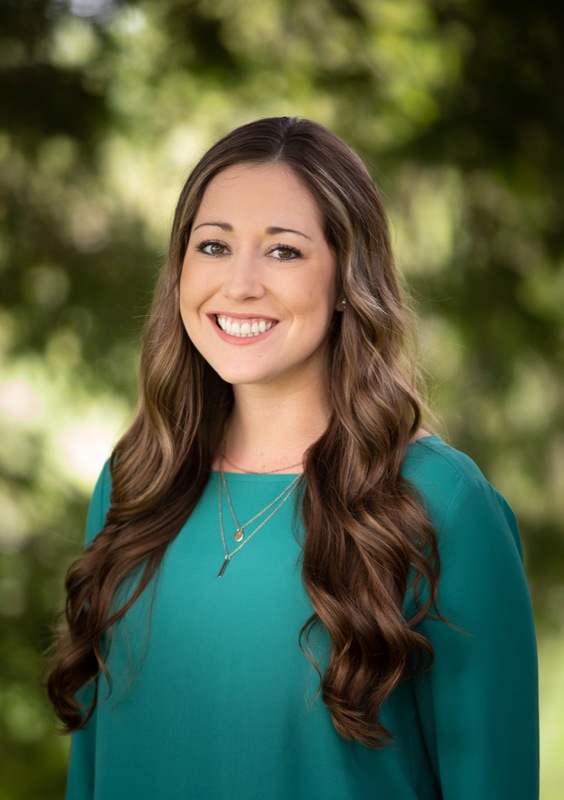 Chelsea holds a Bachelor’s of Science degree in agricultural communications and minor in agricultural business from California Polytechnic University, San Luis Obispo. 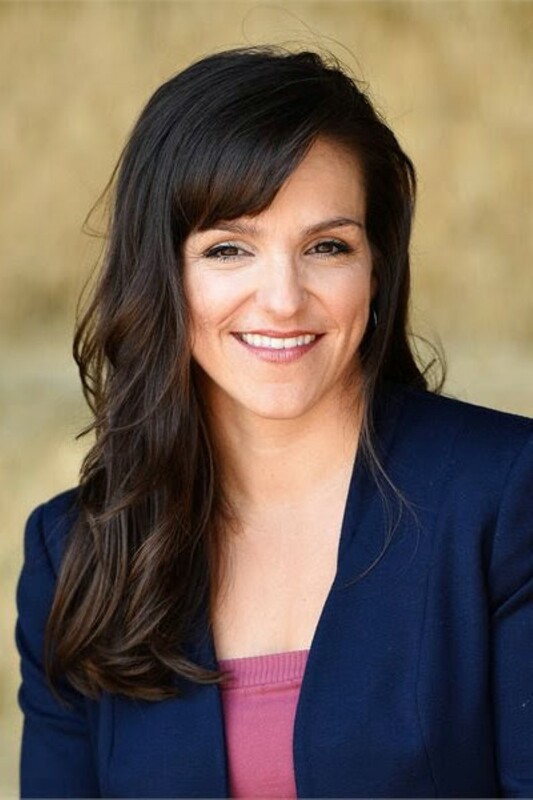 She comes to CFT from California Waterfowl Association as the director of development and prior to that managed the Political Affairs Department of the California Farm Bureau Federation. 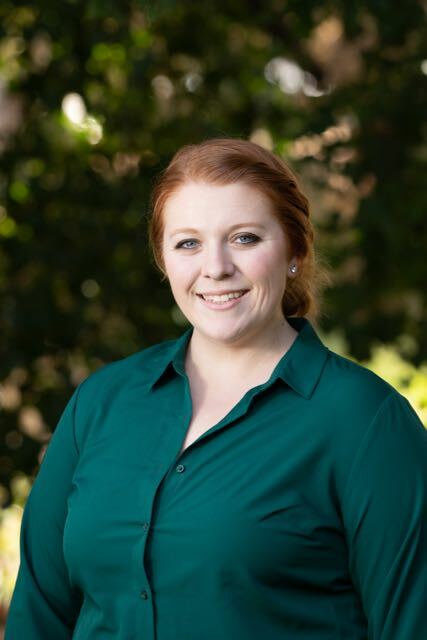 Chelsea serves as a Board Member on the Sacramento County Farm Bureau Foundation for Agriculture Education and is involved with both the Sacramento and San Joaquin County Farm Bureau Young Farmers & Ranchers. In her free time, she enjoys anything and everything outdoors. With Chelsea’s background in agriculture and conservation combined with her love for the outdoors, she finds great joy in seeing productive working lands being protected and devoted to food and fiber production forever. Ron Frietas lives in Modesto with his wife, Nonine. They have two married children and four grandchildren. Ron has had many family members involved in agriculture, including his grandparents on both sides. 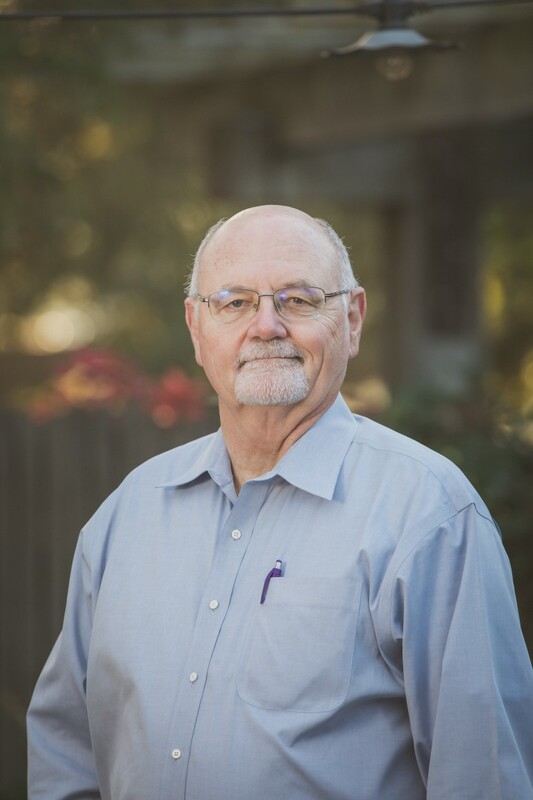 A retired land use planner, Ron served as the Director of Planning and Community Development for Stanislaus County. Now he loves to travel, fish, and spend time with his grandchildren. Ron believes that the Central Valley is a unique world resource, with the water, soil, and climate to grow over 400 commercial crops. 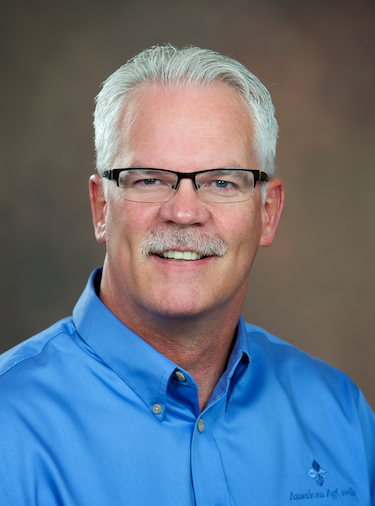 He enjoys serving on the CFT board with like-minded people who understand the great resource which we steward. Jon Harvey lives in Pleasanton with his wife, Kitty; they have two children. Jon’s grandfather grew up on a farm in Nebraska and later inherited part of that land. Jon helped his parents manage the farm and has visited with his mother and uncle. Jon worked for Cisco Systems and is now a ski patroller at Sugar Bowl. He loves to go backpacking, while also enjoying soccer, cooking, playing drums, and fixing cars. Jon became immersed in land conservation at a young age, when he recognized the connections between his appreciation for wildlife, a family history of farming, and his love for fresh food. He also understood that farmers give so much to the environment and to their communities. As he works with CFT, Jon loves being surrounded by inspired people who are both experts in farming and who value nature and the communities in which they live and work. Maxwell Norton lives in Atwater with his wife Diane who is a crop insurance agent. His mother’s family were farmers and he grew up on that farm. He owns a cling peach and almond orchard near Salida and was a UC Farm Advisor for 36 years. Maxwell loves to play saxophone in jazz bands and has an interest in history; he does projects for the local historical society and serves on the Board of Directors of the historic Merced Theater. Maxwell gives of his time and energy to CFT because of his belief that we need to work on very long term solutions to conserving prime farmland. He highly values the serious dedication of everyone involved with CFT. Ken Oneto lives in Elk Grove with his wife, Florence; they have two children, Evan and Erica. The Oneto family has been in the area since 1921 and Ken loves managing the farmland that he owns. Ken graduated from Cal Poly San Luis Obispo with a Bachelor of Science in Agricultural Leadership and farming is his life. 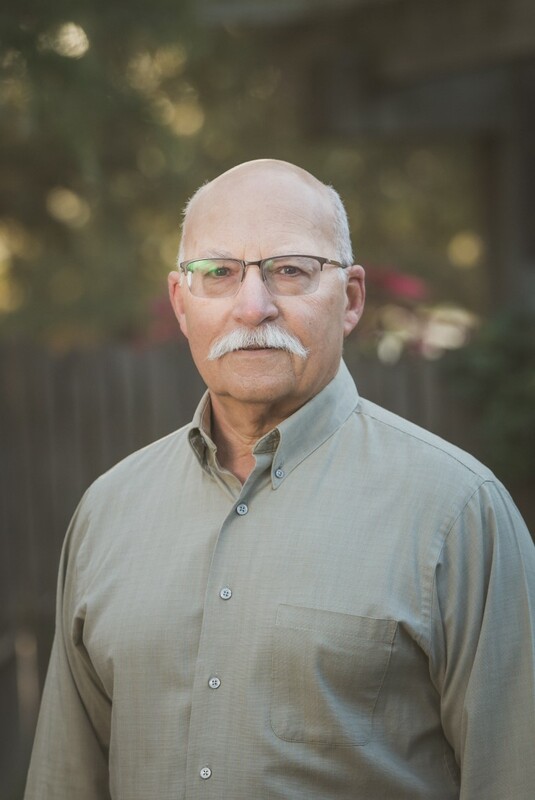 He was a founding member of CFT, having helped to start the Sacramento County land trust that merged with other trusts to become the Central Valley Farmland Trust (which later became CFT). Ken recognizes that an easement is a long term investment and a partnership with the landowner. The organization needs people with a deep understanding of landowners’ needs. He enjoys working with CFT because there is great camaraderie between board members and the staff are really great to work with. Barbara Smith lives in Walnut Grove with her husband, Duncan and their two children, George and Hannah. Her family has been ranching in Placer County since the 1860s and Duncan’s family has farmed in the Delta since the 1860s. Barbara is VP Senior Relationship Manager for BAC Community Bank, and in her free time she enjoys gardening, reading, camping, cooking, and spending time with her family. As a sixth generation rancher, Barbara has a strong sense of legacy to maintain viability of California agriculture. She believes CFT is making a meaningful and positive difference for future generations. Tim Byrd lives in Stanislaus County, west of Modesto, with his wife Suzanne. They have six wonderful children and 3 grandchildren. Tim’s family has farmed in the Central Valley since the 1930s and he and his wife farm almonds on land that has been with the family for over 50 years. Tim is an attorney for E. & J. Gallo Winery, and in his free time he likes to spend time with his family at the farm and the beach. He also likes to spend time with friends, watch his grandchildren play sports, run, and travel. 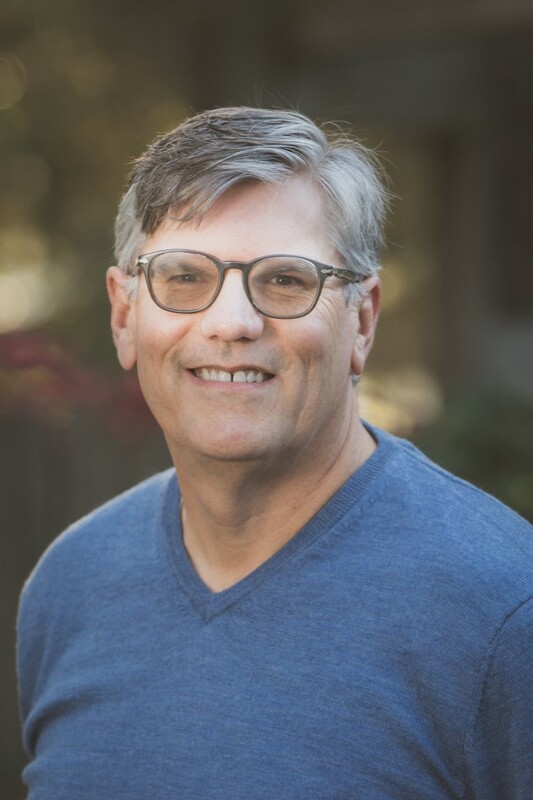 Tim is a founding board member and past president of the land trust that is now CFT. He loves the dedication to the CFT mission that the board and staff have and truly enjoys working with the whole team. Ronald Dolinsek lives in Rocklin with his wife, Georgetta. They have two married daughters and four grandchildren. 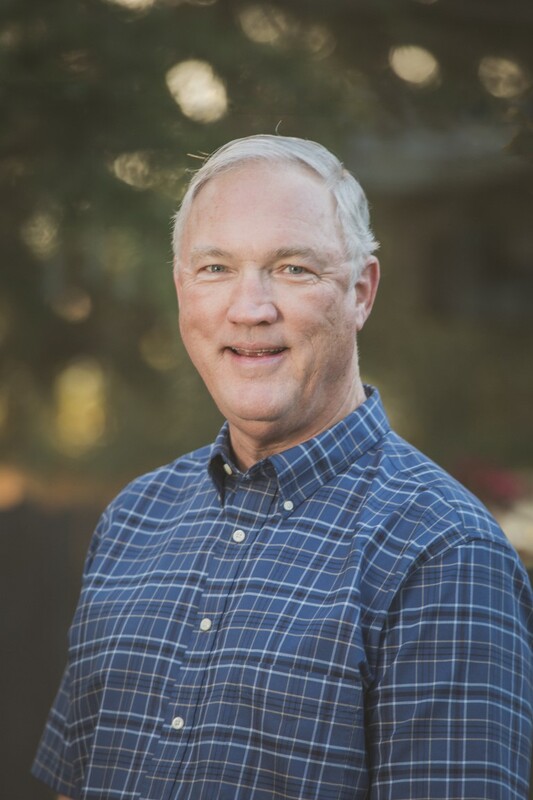 Ron grew up in Santa Rosa and was a member of the local FFA where he worked with livestock and dairy. Ron retired from 34 years in the Farm Credit System and now enjoys overseas traveling where he realizes how blessed he is to live in California. Ron sees how California is experiencing an accelerated rate of housing and commercial development on the world’s best farmland. He feels that we must protect what is left so future generations can enjoy what we have. Larry Ruhstaller lives in Stockton with his wife, Kitty. His family owns farms in several counties, where his grandfather grew the ingredients for his world-famous beers. 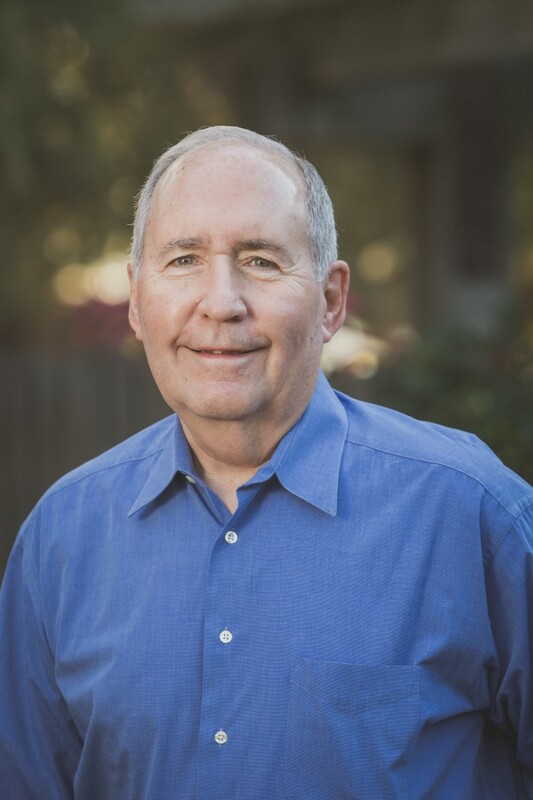 Larry served on the San Joaquin County Board of Supervisors from 2006-2014. Now, he owns an antique store, Ruhstaller’s Camel and the Bear. He serves on several boards and loves to engage with local politics, smoke cigars, and drink single malts. 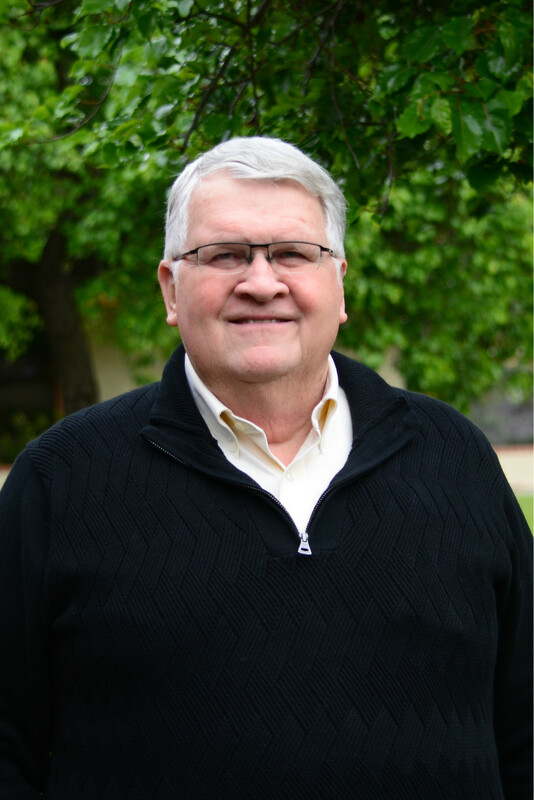 Larry chooses to support CFT’s work because “the most important thing is preserving quality agricultural land.” His favorite aspect of working with CFT is the truly dedicated, smart, and fun people he has the pleasure to work with, and what they have accomplished together. Jim Jorgensen lives in Rocklin with his wife, Dianne. 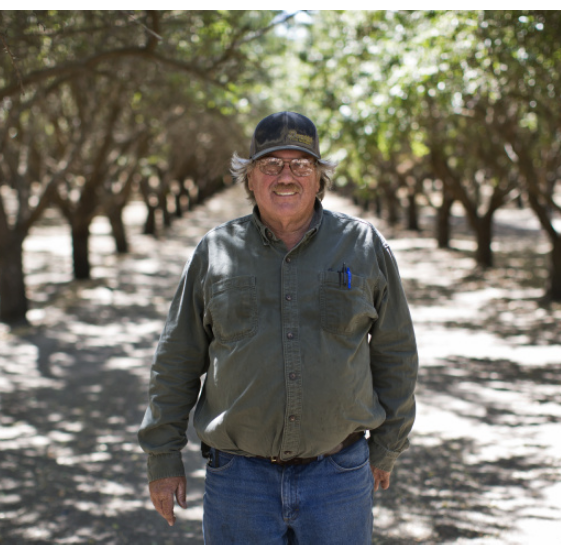 His grandfather came to Gustine in the 1880s and his father farmed 300 acres of walnuts. Jim and his sisters inherited the ranch and placed an agricultural conservation easement on it in 2008. As well as managing Jorgensen Ranch, Jim owns Jorgensen Sports Services. In earlier days, he was a school administrator for 35 years. In his free time, he likes to travel, play golf, attend athletic events, and volunteer in the community. Jim gladly gives of his time, money and effort to support CFT because his parents set that example in his life. He enjoys the friendships of others on the board and the common goal to save land for farming. Patrick Johnston lives in Brentwood where his family has been farming since 1923. He became a partner in Dwelley Family Farms in 2006 and grows both conventional and organic fruits and vegetables. When he’s not farming, Patrick likes to spend time with his wife, Amy, and two daughters, traveling, hiking, and relaxing at home. Patrick has a degree from UC Davis in Sociology, Rhetoric and Communications. 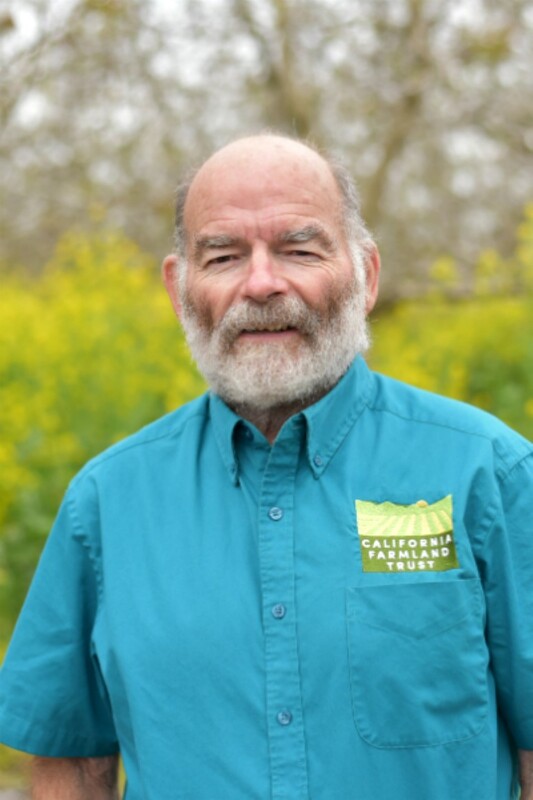 He served on the board of the Brentwood Agricultural Land Trust from 2009 until its merger with Central Valley Farmland Trust to form CFT. He believes it is important that everyone do their part to participate in something that benefits the community in the future. Denny Jackman lives in Modesto; his grandparents were farmers. 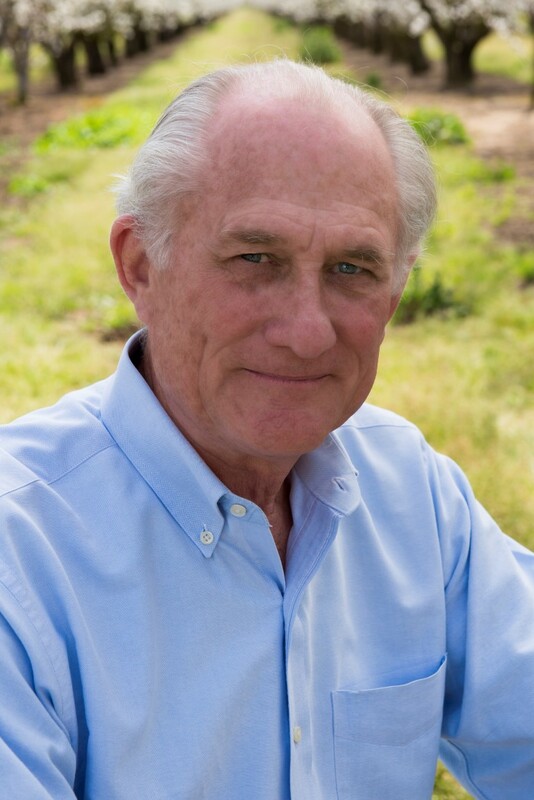 Before he retired, Denny played a role in the development and promotion of farmland protection policies. He has ongoing interests in land-use and transportation planning, and he loves to garden, cook, travel, and undertake remodeling projects. His favorite aspect of serving on the CFT Board is the honor of working alongside people who are committed to the generational protection and provision of our food source. Denny gives of his time because of his strong belief that we all have a duty to preserve our local food source. Sam Zanutto lives in Sebastopol, with his wife Brulene and their two children. Sam grew up on a peach and almond farm near Atwater, where he learned just how fulfilling and rewarding the agricultural lifestyle is. Sam is currently Associate General Counsel at American AgCredit. He joined the farm credit system as an attorney after 10 years as an agricultural lender and several years in private practice. In his spare time he enjoys hiking and other outdoor activities, including grilling and playing music. 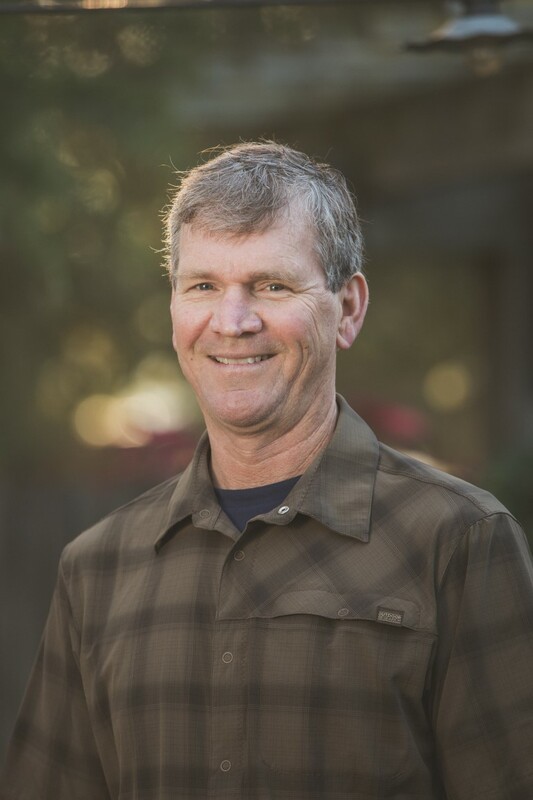 Sam is thankful for the opportunity CFT provides to develop and maintain a new appreciation of California’s best farmland as an inherently valuable natural resource. Tom Rogers lives in Madera with his wife, Linda. Tom is a third-generation farmer who graduated from Fresno State. He has a wide variety of farming experience, from a dairy with corn and alfalfa, to cotton, to the almonds he grows today. When he isn’t busy farming, Tom enjoys wine tasting and spending time with friends. 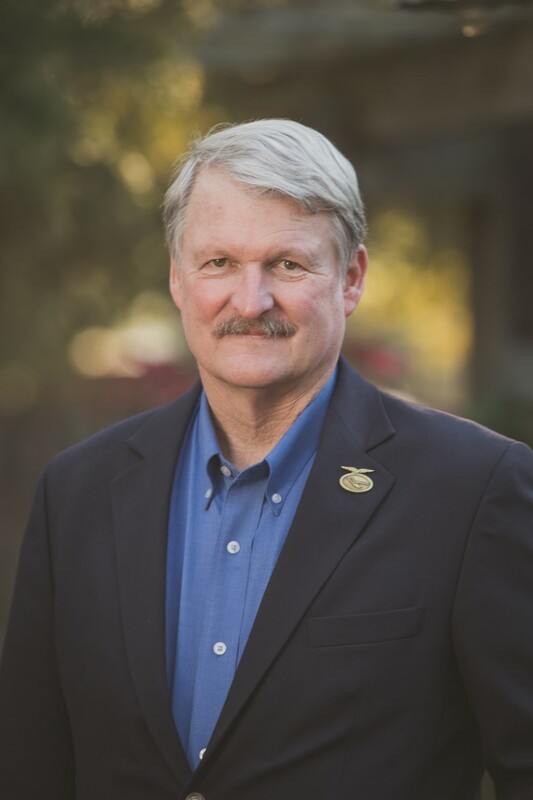 He also serves on several nonprofit boards, including the California Farm Bureau Federation. Tom gives his time to CFT because he appreciates the opportunity to help preserve agriculture for future generations. He enjoys the opportunity to work with really great people who are working toward a common goal – keeping farmers feeding the world. Emily Rooney lives in Lodi with her husband Pat and their son Jake. Her father’s family manage cattle in Lodi and her mother’s family grows row crops and cherries in Tracy. In her free time, Emily loves to go to the coast with her son. 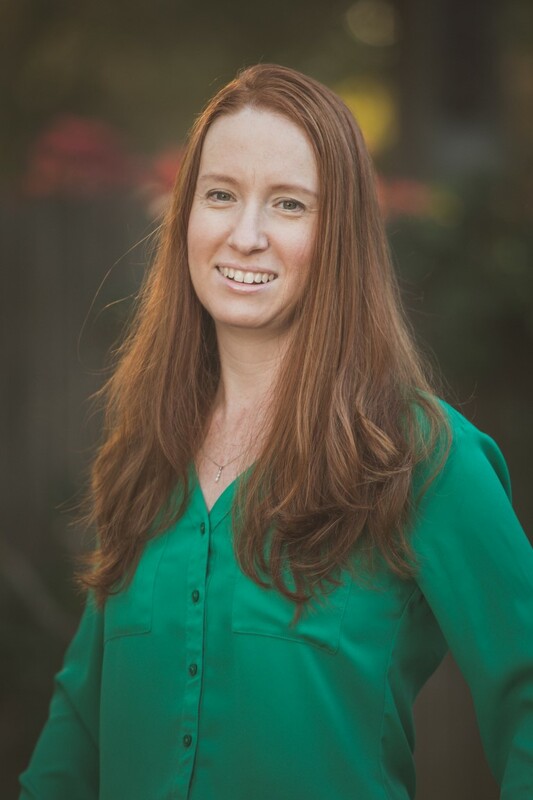 Emily is the President of the Agricultural Council of California and graduated from UC Davis with a BS in Agricultural Economics. She has worked many years in the agriculture policy field including addressing the Williamson Act and the Farm Bill, with connections to land conservation programs. Emily enjoys serving on the CFT Trustee Council because the organization is managed and run by people in agriculture for agriculture. Paul Wenger lives in Modesto with his wife Deborah and farms alongside two of their sons. He is a third generation farmer and works land purchased by his grandfather in 1910. He has raised dairy steers and now grows almonds, walnuts and various field crops. Paul recently completed an eight year term as President of the California Farm Bureau Federation and now is farming full time again. In his spare time he loves to be hiking in nature. 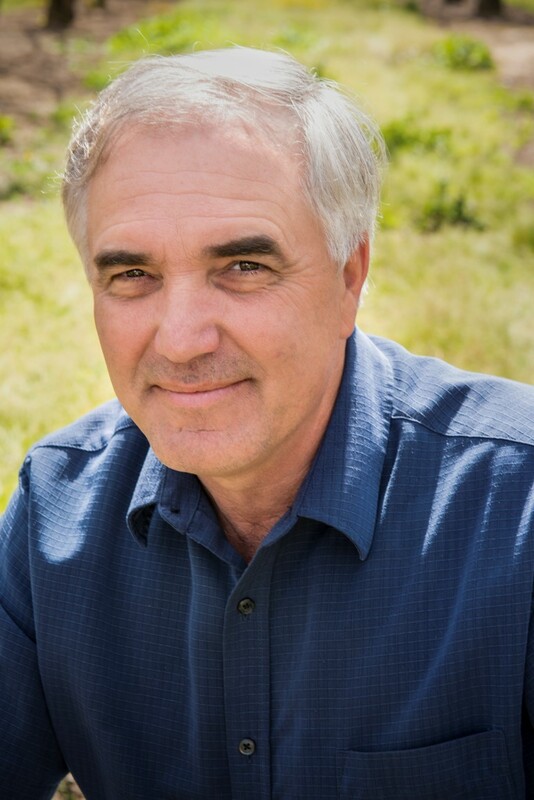 Paul believes that prime farmland is an increasingly valuable and limited resource. Every effort must be made to protect these resources from urban encroachment and development. 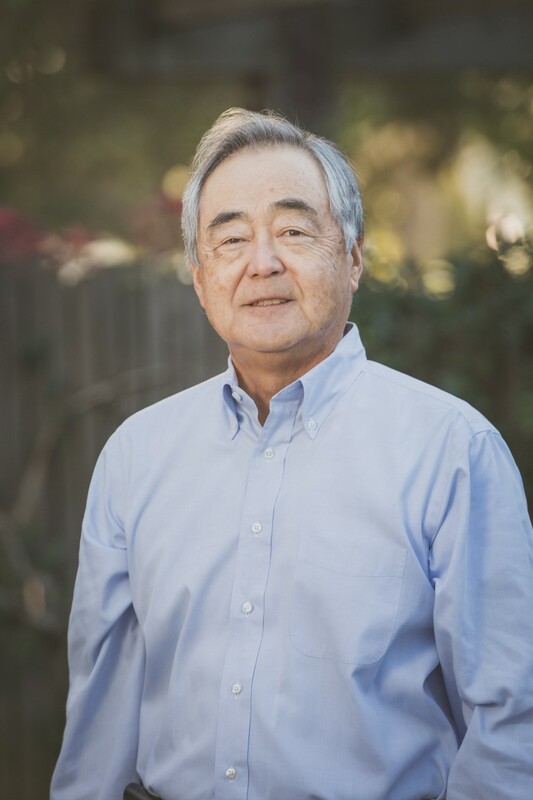 Ed Nishio lives in Roseville with his wife, Fran. His father farmed in southern California and his grandfather also started a farm in Orange County and organized a celery cooperative in 1906. Ed retired from CoBank, part of Farm Credit System, where he financed farmer-owned cooperatives/agribusiness across the western US for 41 years. He now enjoys golf and spending time with his grandson. Ed’s passion for protecting farmland comes in part from growing up in Whittier and Huntington Beach, where he watched precious farmland get bulldozed and covered with houses and strip malls. He has seen the same thing happening in the Central Valley. He loves to work alongside staff and volunteers at CFT who are passionate about preserving farmland for the future. George Gomes lives in Carmichael with his wife Ella. They have two children and three grandchildren. George grew up on a dairy farm that also produced hay and grain. Before retiring from regular working hours, George was the Undersecretary for the California Department of Food and Agriculture (CDFA). Now he likes to visit family, especially his grandchildren. He also enjoys doing volunteer work, hunting, and gardening. Between his roles at CDFA and at the California Farm Bureau Foundation, George devoted 26 years to keeping family farms in business. 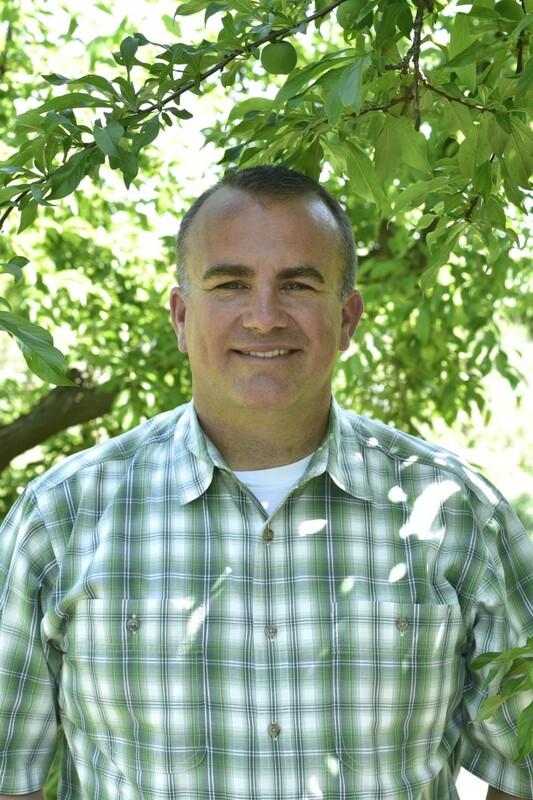 He serves on the CFT Trustee Council because he grew up watching family farms struggle and wants to help them succeed. He loves seeing CFT keeping family farming viable.